Heavy Duty Floor / Ground Demonstration Stand for Galaxy Tab / Galaxy Note, Acer, iPad 13.0 Tablets [MnM003747-U13] : Onchee.com - the accessory shop for all your handheld Electronics! Trendy aluminum alloy made heavy duty floor stand for iPad / tablets with screen up to 13.0" with security lock. The table holder is 360 degree rotatable for portrait or landscape orientation. The built-in lock can prevent tablet from theft. The stand is heavy enough (around 7.3kg / 16.0 Lbs Net) and not easy to fall over. The stand is perfect for presentation and interactive system display. It is good for running in-store display demos, trade show booth presentations and even school exhibits. 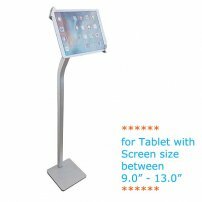 - Universal: Fits for tablets with screen not larger than 13.0"
- Sleek modern design: Great for trade shows, restaurants, hotels, schools, offices, churches, small and large shops, museum display. - Samsung Galaxy Tab Pro 12.9"
- Samsung Galaxy Note Pro 12.9"
Customized Desktop Anti-Theft POS Stand Holder Enclosure w/ Lock & Key for for AppleiPad Pro 10.5"